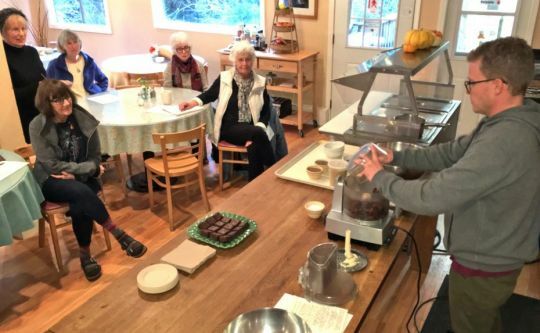 Mike Ditch giving a vegan brownie cooking demonstration during a Road Scholar retreat, Land of Medicine Buddha, Soquel, California, US, February 2019. Photo by Ven. Losang Drimay. Land of Medicine Buddha (LMB), an FPMT center in Soquel, California, US, partners with the nonprofit Road Scholar program to offer retreats at LMB. Founded as Elderhostel in the summer of 1975, Road Scholar began as a learning program conceived to combine not-for-credit classes with inexpensive lodging for older adults. This partnership is an example of two of FPMT’s Five Pillars of Service: community service and revenue generation. Breige Walbridge, LMB Road Scholar coordinator and qi gong and aromatherapy instructor, talks about working with Road Scholar in an interview conducted by FPMT registered teacher and LMB spiritual program assistant Ven. Losang Drimay. Q: How long has LMB been offering Road Scholar retreats? We started with two programs in 1996. When Murray Wright was the center director, someone suggested that Elderhostel would be a good match for LMB and a way to support the center. It offers programs that are beneficial and enhance people’s lives. So, LMB contacted the organization, who then came and checked out our facilities, looked at our program ideas, and a partnership was formed. 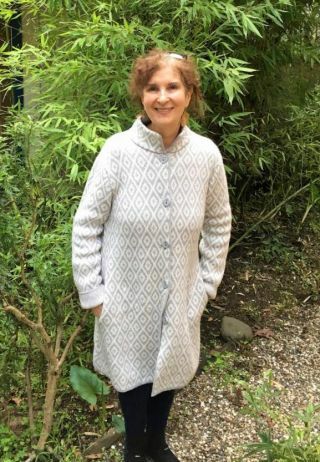 Breige Walbridge, road scholar coordinator at Land of Medicine Buddha, qi gong and aromatherapy instructor, Soquel, California, US, February 2019. Photo by Ven. Losang Drimay. Q: Who actually manages the programs? The coordinator at LMB comes up with ideas, presents it to Road Scholar, and Road Scholar handles the advertising and registration. I started working at LMB in 1999 as spiritual program coordinator (SPC). Elderhostel was then part of the spiritual program department. In 2000, the job was split off from SPC, and I became the Elderhostel coordinator. So this will be my twentieth year coordinating the Elderhostel/Road Scholar programs. Q: How many Road Scholar retreats do you run in a year? We have twelve to sixteen retreats in a year with several different themes. These days we are just running the three most popular themes, but we might be adding a new one next year. The current themes are Buddhist Insights into Living and Dying; Energy Massage and Qi Gong; Vegetarian Cuisine and Nutrition; Buddhist Thinking, Meditation and Qi Gong; and a Rejuvenation Retreat for Women. The Rejuvenation Retreats include meditation, qi gong, aromatherapy, and massage for self-care. In the longer version of the Rejuvenation Retreat we add herbs for vitality and yoga. All the retreats include some extracurricular activities such as nature walks, music evenings, and a gompa tour. Sometimes we also have creating mandalas. The Rejuvenation Retreats for Women are four to five days. The co-ed programs are six days. Q: How many people does it take to put on one Road Scholar retreat? I do the administrative work and I’m the group leader. I have an assistant named Linda who helps with some of the administrative work and teaches one class. There are quite a few teachers: usually two meditation/Buddhism teachers, someone teaching qi gong (myself or another person), someone teaching massage, aromatherapy, yoga, nutrition, vegetarian cuisine, musicians, someone leads the nature walk, and more. For a recent six-day program, we had ten different teachers involved. Some of them just taught one class. There are many topics and activities, sometimes including vegetarian cooking with our chefs, Stephanie and Mike. The teachers have great expertise in their field and are wonderful communicators. In addition to the Road Scholar faculty and administrators, the LMB staff provide a wonderful environment. LMB is all set up for housing overnight guests and serving delicious, fresh-cooked, vegetarian meals. We already have the whole hotel/conference center operation here. There is a supportive staff here providing care and comfort for the guests. 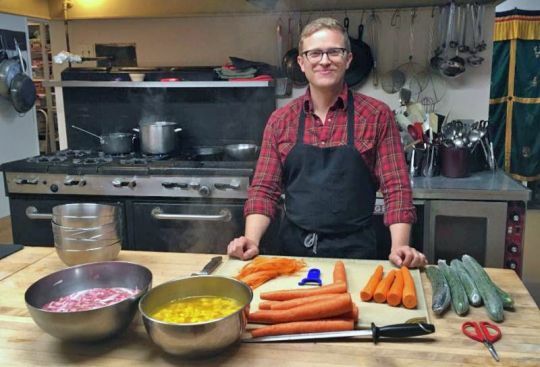 Mike Ditch, chef and cooking instructor for some of the Road Scholar retreats. Mike specializes in vegan and Vietnamese, Korean, and Japanese cuisines, Land of Medicine Buddha, Soquel, California, US, February 2019. Photo by Ven. Losang Drimay. Q: What do people get out of it? It’s a very enriching program. People learn a lot, get lifestyle tools that they can bring home with them, and get leads on things that they might follow up on when they get home. It can be life changing. The social aspect is an important element. Some people come here on the heels of some sort of loss, grief, or other difficult life situation. Participants make new friendships that they continue after they leave. They enjoy meeting like-minded people who also enjoy learning new things. The typical Road Scholar participant is intelligent, open-minded, and engaged. Road Scholar programs are for people age forty and older, but people who are forty or older can bring along someone younger. In the last retreat, most participants were from out-of-state. Sometimes it’s about half from California and half from elsewhere. In general, people feel relaxed here and like the environment. They like the spiritual, peaceful atmosphere and the beauty of the redwood forest and nature. They feel that they are in a very special place. We have beautiful grounds. The accommodations are rustic, simple, and clean. Q: How does the Road Scholar program fit in with the overall mission of LMB and our organization? I feel very inspired by Lama Yeshe’s vision for Universal Education and often think of Lama and this vision when running the retreats. I also hope if Lama Zopa Rinpoche were looking at this program, he would be happy that it gives a lot of benefit. Several years ago, Rinpoche expressed to me that the two most important things were that people feel compassion from me and that they have a chance to see the holy objects. Feeling warmth and compassion from the wonderful staff here is an important part of the experience for the guests. FPMT.org and Mandala Publications brings you news of Lama Zopa Rinpoche and of activities, teachings, and events from over 160 FPMT centers, projects, and services around the globe. If you like what you read, consider becoming a Friend of FPMT, which supports our work.